There are many ways to begin an enterprise or industrial Internet of Things (IoT) journey. What's important is not to let the perceived complexity of the IoT obscure the possibilities for implementing what should be very rewarding projects. You can get started by laying a solid framework for your IoT system. The IoT is more than Internet-connected consumer devices. Sooner or later, your IT organization will need you to create an infrastructure to support it. Energy companies already use networked sensors to measure vibrations in turbines. They feed that data through the network to computing systems that analyze it to predict when machines will need maintenance and when they will fail. Jet engine manufacturers embed sensors that measure temperature, pressure, and other conditions to improve their products. Even a gift basket business can deploy sensors to constantly monitor the temperature of perishable products. If temperatures in storage or in transit start to rise, they can expedite deliveries. This has the dual advantage of increasing customer satisfaction while avoiding product spoilage. The IoT opens far more opportunities than most organizations are pursuing today. And even when they do pursue them, IT leaders don’t always fully engage in IoT-related requests. Industry discussions of IoT initiatives often emphasize complexity and involve areas of the business in which IT hasn’t traditionally been involved. The proliferation of unfamiliar IoT technologies—some of them industry-specific—and the vast scope of the global IoT itself can intimidate IT and obscure the possibilities for what should be very achievable and compelling projects. So, how can your infrastructure support IoT? You'll need to invest in the kind of four-part architecture that supports many IoT systems today. Picture these four parts as stages in a process. All four are integrated, mutually reinforcing structures that carry value-laden data from the various networked "things" to production and traditional IT systems to deliver actionable business insights. 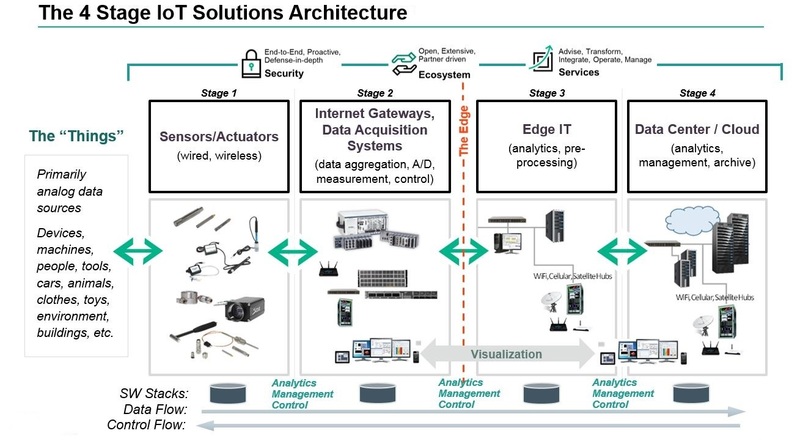 Stage 1 of an IoT architecture consists of your networked things, typically wireless sensors and actuators. Stage 2 includes sensor data aggregation systems and analog-to-digital data conversion. In Stage 3, edge IT systems perform preprocessing of the data before it moves on to the data center or cloud. Finally, in Stage 4, the data is analyzed, managed, and stored on traditional back-end data center systems. Clearly, the sensor/actuator state is the province of operations technology (OT) professionals. So is Stage 2. Stages 3 and 4 are typically controlled by IT, although the location of edge IT processing may be at a remote site or nearer to the data center. The dashed vertical line labeled "the edge" is the traditional demarcation between OT and IT responsibilities, although this is blurring. Here's a look at each in detail. Sensors collect data from the environment or object under measurement and turn it into useful data. Think of the specialized structures in your cell phone that detect the directional pull of gravity—and the phone's relative position to the “thing” we call the earth—and convert it into data that your phone can use to orient the device. Actuators can also intervene to change the physical conditions that generate the data. An actuator might, for example, shut off a power supply, adjust an air flow valve, or move a robotic gripper in an assembly process. The sensing/actuating stage covers everything from legacy industrial devices to robotic camera systems, water-level detectors, air quality sensors, accelerometers, and heart rate monitors. And the scope of the IoT is expanding rapidly, thanks in part to low-power wireless sensor network technologies and Power over Ethernet, which enable devices on a wired LAN to operate without the need for an A/C power source. In an IoT architecture, some data processing can occur in each of the four stages. However, while you can process data at the sensor, what you can do is limited by the processing power available on each IoT device. Data is at the heart of an IoT architecture, and you need to choose between immediacy and depth of insight when processing that data. The more immediate the need for information, the closer to the end devices your processing needs to be. For deeper insights that require more extensive processing, you'll need to move the data into a cloud- or data center-based system that can bring several sources of data together. But some decisions simply can’t wait for deep processing. Did the robotic arm performing the surgery cut an artery? Will the car crash? Is the aircraft approaching the threat detection system a friend or a foe? You don't have time to send that data to your core IT assets. You must process the data right at the sensor— at the very edge of the edge network—for the fastest response. The data from the sensors starts in analog form. That data needs to be aggregated and converted into digital streams for further processing downstream. Data acquisition systems (DAS) perform these data aggregation and conversion functions. The DAS connects to the sensor network, aggregates outputs, and performs the analog-to-digital conversion. The Internet gateway receives the aggregated and digitized data and routes it over Wi-Fi, wired LANs, or the Internet, to Stage 3 systems for further processing. Stage 2 systems often sit in close proximity to the sensors and actuators. For example, a pump might contain a half-dozen sensors and actuators that feed data into a data aggregation device that also digitizes the data. This device might be physically attached to the pump. An adjacent gateway device or server would then process the data and forward it to the Stage 3 or Stage 4 systems. Why preprocess the data? The analog data streams that come from sensors create large volumes of data quickly. The measurable qualities of the physical world in which your business may be interested—motion, voltage, vibration, and so on—can create voluminous amounts of constantly changing data. Think how much sensor data a complex machine like an aircraft engine might generate in one day, and there’s no theoretical limit to the number of sensors that could be feeding data into an IoT system. What’s more, an IoT system is always on, providing continuous connectivity and data feeds. IoT data flows can be immense—I've seen as much as 40 TB/second in one case. That's a lot of data to transport into the data center. It's best to preprocess it. Another reason not to pass the data on to the data center in this form is that analog data has specific timing and structural characteristics that require specialized software to process. It's best to convert the data into digital form first, and that's what happens in Stage 2. Intelligent gateways can build on additional, basic gateway functionality by adding such capabilities as analytics, malware protection, and data management services. These systems enable the analysis of data streams in real time. Although delivering business insights from the data is a little less immediate at the gateway than it would be when sent directly from the sensor/actuator zone, the gateway has the compute power to render the information in a form that is more understandable to business stakeholders. Gateways are still edge devices—they’re external to the data center—so geography and location matter. In the pump example, if you have 100 pump units and want to process data on-premises, you might have instant data at the pump level, aggregate the information to create a plantwide view for the facility, and pass the data on to the data center for companywide view. DAS and gateway devices may end up in a wide variety of environments, from the factory floor to mobile field stations, so these systems are usually designed to be portable, easy to deploy, and rugged enough to withstand variations in temperature, humidity, dust, and vibration. Once IoT data has been digitized and aggregated, it's ready to cross into the realm of IT. However, the data may require further processing before it enters the data center. This is where edge IT systems, which perform more analysis, come into play. Edge IT processing systems may be located in remote offices or other edge locations, but generally these sit in the facility or location where the sensors reside closer to the sensors, such as in a wiring closet. Because IoT data can easily eat up network bandwidth and swamp your data center resources, it's best to have systems at the edge capable of performing analytics as a way to lessen the burden on core IT infrastructure. If you just had one large data pipe going to the data center, you'd need enormous capacity. You'd also face security concerns, storage issues, and delays processing the data. With a staged approach, you can preprocess the data, generate meaningful results, and pass only those on. For example, rather than passing on raw vibration data for the pumps, you could aggregate and convert the data, analyze it, and send only projections as to when each device will fail or need service. Here's another example: You might use machine learning at the edge to scan for anomalies that identify impending maintenance problems that require immediate attention. Then you could use visualization technology to present that information using easy-to-understand dashboards, maps, or graphs. Highly integrated compute systems, such as hyper-converged infrastructure, are ideally suited to these tasks because they're relatively fast, and easy to deploy and manage remotely. Data that needs more in-depth processing, and where feedback doesn't have to be immediate, gets forwarded to physical data center or cloud-based systems, where more powerful IT systems can analyze, manage, and securely store the data. It takes longer to get results when you wait until data reaches Stage 4, but you can execute a more in-depth analysis, as well as combine your sensor data with data from other sources for deeper insights. Stage 4 processing may take place on-premises, in the cloud, or in a hybrid cloud system, but the type of processing executed in this stage remains the same, regardless of the platform. The 4-stage approach to IoT infrastructure and processing will require new levels of collaboration, particularly as the separations between these stages start to blur. If you’re an OT professional, be prepared to work side by side with IT professionals. If you’re in IT, get ready to collaborate more closely with OTs. Eventually, the two functions will converge as the IoT pulls domain expertise deeper into data processing. IT professionals can build their IoT skills by starting small and working with domain experts to identify sources of potentially valuable data. Would understanding the operating conditions of a machine help operations design more efficient maintenance cycles? Could developing knowledge of air temperature fluctuations in a warehouse help to improve product storage? Investigate the sensors and edge devices you would need to harvest the data. Design the infrastructure. Then experiment to make sure that the project produces results that make for a strong business case. The IoT continues to reshape commercial, industrial, scientific, and engineering endeavors in profound and unpredictable ways. In the scientific revolution of the 17th century, newly invented instruments extended the reach of human senses far into the microscopic and astronomic realms. The IoT is the instrument that will enable your organization to connect intelligent technologies to the data-emitting universe of objects. The implications for IT infrastructure will be just as far-reaching.